In fall of 2016, the two-man developer team at Somasim put out a fantastic simulation and management title: Project Highrise. Project Highrise was touted as “the game SimTower should have been,” by Gaming Trend, and I heartily agree. Less than a year later, Kasedo Games and Somasim kick it up a notch with the hospitality-driven DLC. 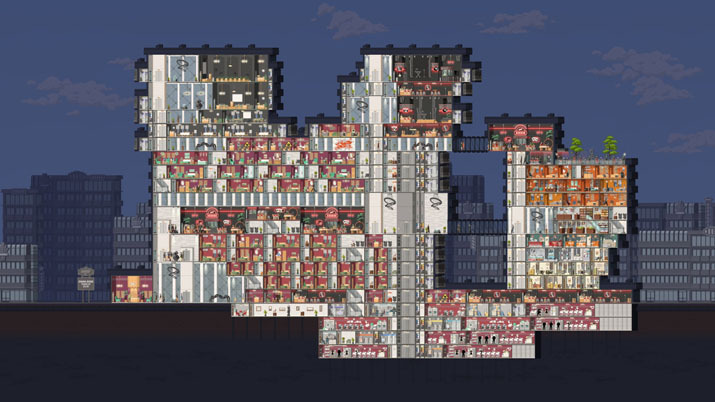 The community that the title has gathered behind it yearned for the hotel functionality that was present in Yoot Tower, a title developed by one of the SimTower creators. Sonasim didn’t just meet expectations, but surpassed them by adding not only hotel rooms, but all the casino glitz and glamor you would expect with a name like Project Highrise: Las Vegas. The overall aesthetic of the game hasn’t changed much. A new Las Vegas skyline background has been added, and, of course, the new assets for your rooms and casinos, but they stay true to the base game and everything seamlessly fits together. It’s clear that the developers were calling on classic games as the primary art style, and this might turn some gamers away, but anyone looking for mid-90s sim nostalgia will be in for a treat. While the hotel and casino assets are new, you spend a lot of time adding shops and restaurants, just like you would any other building. In fact, you’ll probably devote more time to this task so that you can upgrade from basic to deluxe rooms, which fetch a higher profit. In an effort to make your hotel comfortable, no room is complete, especially in the sweltering Nevada heat, without ice-cold air conditioning. Now, you’ll not only have folks waddling to their office with hot coffee and fresh donuts, but you’ll have spectators watching the likes of Mary Tyler Less bless the stage, or rock stars slaying the crowds at all hours of the night, as the casino never truly sleeps. It appears that, with additional revenue sources, bars, and casino games — as well as the higher daily rates of the hotel rooms over all those offices — you’ll bring in income faster than you would with a standard commercial or apartment building. There are also additional hotel and casino special contracts that can be completed to bring extra cash and prestige. 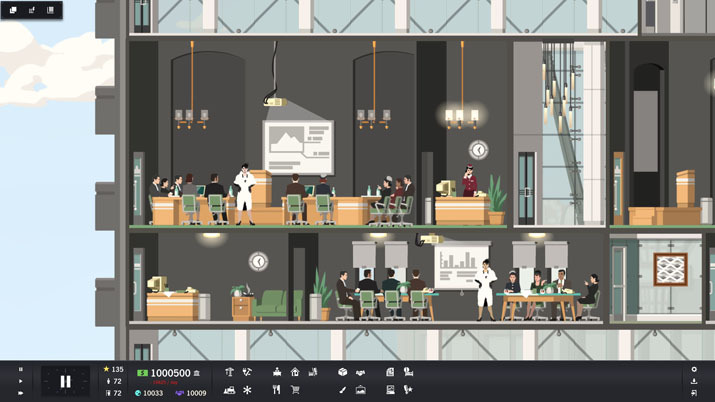 While Project Highrise does have a series of tutorials and an additional module to cover the hospitality content, there’s not a whole lot of hand-holding. In some cases, it might take some time to figure out what you’re doing wrong, and the messaging can be ambiguous. While an issue may be easy to solve, it leaves you scratching your head; for instance, one of the added features was a service elevator, alongside the passenger elevator. The service elevator is for your housekeeping carts, the other for patrons. This mistake, which after reading about the in-game tooltip seemed obvious after the fact, nearly bankrupted my newly blossoming hotel. I was low on funds and had to start tearing rooms out to set up a whole new set of passenger elevators because people couldn’t reach their accommodations (and, let's be honest, no one goes to Vegas to be healthy and use the stairs, so I didn’t place any). If it weren't for a timely bailout by a very generous creditor, we would have had to close our doors. Once people could get to their rooms though, we were rocking and rolling. I had assumed it was an error or glitch that caused the message to pop-up in rapid succession over each room, but it turns out I’m just an idiot who don't read good. 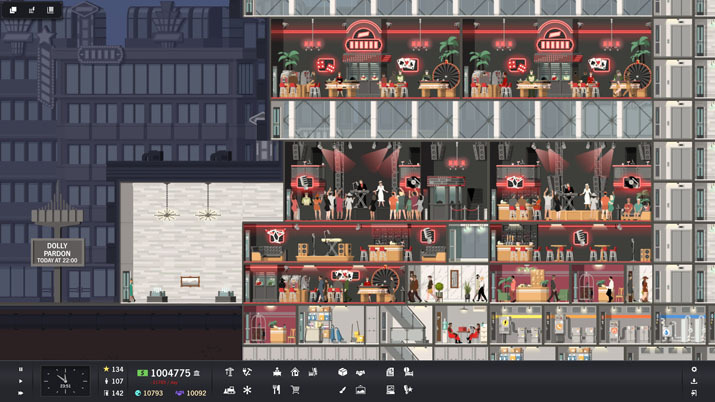 Project Highrise is a top-notch simulation and management game. It’s like Tiny Towers on steroids, and brings back my 1994 Maxis nostalgia, with an art style and aesthetic very similar to previous tower sims. It doesn’t disappoint in any way. The additional content added in the Project Highrise: Las Vegas brings the casino flair, is enough to vary the way you play, and give you an entirely different architectural experience. In addition to base game, the decisions by Sonasim to include, mods, steam cloud and mac support allow for a lengthy, diverse and easily accessible experience. I’ve got my casino empire blowing up now while I should be focusing on things that pay the bills. Please don't tell my editor.